Shred Pro Secure IT operates a secure disposal and recycling of all your redundant office equipment. Data is wiped from any data-carrying device, but if this is not possible the device will be destroyed and a certificate of destruction provided. 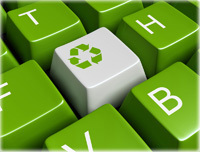 Due to recent and increased tightening of British Law ruling on the destruction of IT and computer equipment, many companies now wish to recycle their redundant equipment and subsequently help in closing the environmental loop. Computers and monitors for example, can no longer be discarded indiscriminately and must now be disposed of in an environmentally and ecologically friendly manner. Safe disposal is now even more imperative as some IT equipment contains toxic components that would be harmful to the atmosphere if disposed of incorrectly. The data protection law now instructs that some information stored on a computer hard drive could be confidential and must therefore be destroyed and or deleted in a confidential manner. 1. Data is wiped from any data-carrying device, but if this is not possible the device will be destroyed and a certificate of destruction provided. Servers, PC’s, Monitors, Printers, Photocopiers, Scanners, CD ROM’s, CD Writers etc. 3. A Certificate of Destruction will be issued compliant with the WEEE. Regulations and the Data Protection Act of 1998. A Certificate of Destruction will be issued compliant with the WEEE Regulations and the Data Protection Act of 1998. Items which we can dispose of include:Servers, PC’s, Monitors, Printers, Photocopiers, Scanners, CD ROM’s, CD Writers etc.